I worked with a psychologist around 1980 who had trained at an expensive private psychiatric farm/camp/hideaway/rehab in NoCal that had taken in many important people when they had "episodes," including Jonathan Winters. Winters has long been a favorite of mine, and I nearly wore out "Another Day, Another World" when I was in junior high. I had heard that Winters was what we called Manic-Depressive in those days, and it gave me some understanding of the edge, the difficult balance between loose associations and wit. Dr. Fields related a story about Jonathan being brought in on a somewhat emergent basis, and staying at the retreat a few weeks. Frank said he wasn't there himself at the time, but Winters remained legendary among the staff and the tale seemed credible. The comedian had ended up naked in a fountain in Las Vegas or some such thing, and the California psychologist who ran the joint had stroked his beard and said, rather typically "Well Jonathan, did you learn anything from the experience?" "Yes," Winters is supposed to have replied "I learned that we should never land on this planet one at a time." I must have told that story a hundred times, always careful to note that it is third hand and suspect but still, I hinted broadly, plausible and likely true. I posted it hear about five years ago. Well, maybe. Comedians do reuse, streamline, and perfect material and all that. But today I was listening to 60's comedy on Pandora and there was a routine from "The Wonderful World of Jonathan Winters." I was sitting comfortably on the porch nibbling on cheese, crackers, and pepper jelly and distinctly heard in his introduction (which obliquely references being put back in the zoo), "We should never land on this planet one at a time." Dr. Fields likely lifted the story from the record. At least I know that Winters actually did say the line, though it's nowhere near as interesting this way. And seeing that people are even less likely to be listening to introductions of 1960's comedy albums now, maybe I can still get away with it. I am Al Wyman's son, after all. 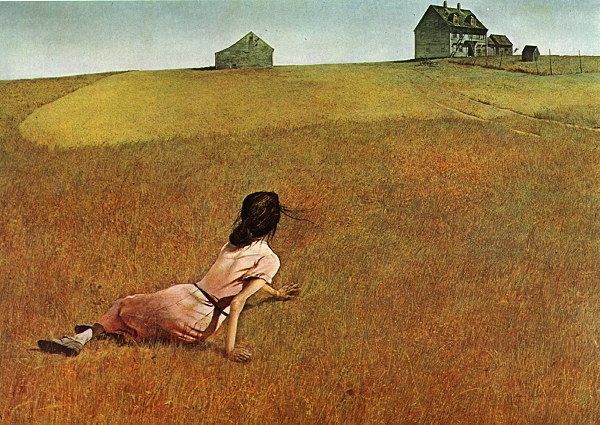 Years ago, an artist friend showed me that Wyeth's point-of-view in "Christina's World" is intentionally just a bit off. Where the artist is standing is not quite right, as if he is eight feet tall or standing on a platform of some sort. The effect is an increased detachment from the scene, which in turn makes Christina even more isolated, out-of-sync, abandoned. Nifty stuff, which I never see myself in the visual arts and have to wait for someone smarter to show it to me. Apparently someone is having another go at making Watership Down into a movie. The first one was awful; I fear what the second will bring. Yet to explain that I have to reflect some on what it was that was just not right about the original version. The closest references to landscape are still shortened, as if a man who had been on all fours among the rabbits rose to his knees briefly and looked about. The perspective of the narrator in Watership Down is very low. Not quite chin-to-the-ground, as the speaker is clearly a human among the rabbits and not a rabbit himself. I don't know how much of this was device on the author's part and how much was simply automatic in wanting to describe lapine life up close. Not only is it low to the ground, it is often underground, where our eyes and ears are very close to the rabbits. We can almost feel the fur, smell the earth at those moments. Adams moves us into their world via this perspective. Things at distance might be smelled or heard, but they are not seen. This is what makes it so uplifting and exalting when Fiver has a vision of a place where they can actually be up high and see far. He is imagining something almost completely unfamiliar to rabbits. Even Hazel can barely grasp it, and the others seem to go along largely by trust. When they reach the place and look out we are transported as well. This world is a new thing to them, a magical place, and we feel it with them, having lived down on the ground with them for so long. Hazel's inspiration that Keehar could be useful to them because he can see far is an enormous leap for creatures who likely can't even perceive things clearly beyond a few dozen yards. As any number above four is is simply hrair, many, where five and a thousand are not clearly distinguished, so also is distance, where anything farther than a two-second dash is not understandable, the stuff of visions. It is this perspective that gives Watership Down its power, rather than detracting from it. I focus on conversation and plot when I read, neglecting description, but I may have bequeathed that sense of place to my children anyway because of reading aloud. When I at last finished my first reading to Ben (Jonathan listened in for some of it), he grabbed the book and turned immediately to the beginning, reading it on his own even though it was beyond even his level. He reached the end and without even pausing for breath turned back to the introduction - no map, no table of contents. He lived in that world for months, really. invisible and on his stomach among the rabbits. We went to England in the summer of 1997. The February before I discovered in amazement that Watership Down was an actual place. We have to go, Ben and I whispered to each other. We have to see this. It was fun, and carried a sense of completeness and goal-achieved, but it wasn't magical. It wasn't breathtaking or life-changing. Now I know why. It was Watership Down, near Overton and Kingsclere, but we only saw what human beings see. It wasn't Watership Down, where rabbits live and Bigwig once explored. For that we would have to have gotten down on the ground for a long period of time, even overnight, to adjust to the difference in place. Interestingly, the first movie got that part right, if I recall correctly. A lot of it took place right up close to the rabbits, without much looking down on them from a Keehar's-eye view. Yet they got another perspective largely wrong, and the contrast took us out of any reasonable suspension of disbelief. In drawing a cartoon, they put us immediately back into the world of humans. Those rabbits are stylised according to human terms. That's not a problem for the grass and sky and weather, but it doesn't work for the rabbits. To get it right, it would have to be cartoon rabbits the way that rabbits would see them - rabbits as they are imagined in Dandelion's stories. I have no idea what that is, but I would bet that shapes and features would be less important, sound (and feel and smell) more important. Chip and Dale can be cartoons; Toad, and Ratty, and Mole can be cartoons because they are mostly people-children with animal characteristics. Charlotte and Templeton can be cartoons because the whole story is really from Fern's perspective they are peoplish as well. She is moving them about on the land of counterpane. But Strawberry is a rabbit. He is stretched to acquire some human characteristics, perhaps, but he remains a rabbit. Hyzenthlay is a rabbit, however much her words echo a timeless feminine of many creatures. Woundwort is already becoming a cartoon even as he lives, and it is not surprising that Adams goes almost immediately into what his mythic legacy is among rabbits. Yet even he is still mostly rabbit. Even with CGI, how do you get that rabbitness, that underground confinement that is comfort, that circumscribed landscape into a movie? Update: Reading up on the 1978 film, I wonder why I didn't like it better. They seem to have gotten many of these points right. As I had not read it out loud yet, perhaps the voices bothered me. I now recall that when I read it I thought of the voices as murmurs rather than enunciated, and had some decisions to make how I was going to portray that when I did thm myself. Update: bsking correctly notes that the bubble of a zip code is based on where they lived when they were at age 10, not where they are now. I knew that but promptly forgot it, and it changes the discussion below. Take some time to at least browse those, as it his further exploration of the numbers. Looking at which zip codes are most insulated from the rest of us in Lessons: 2 was fun. I did note that the Massachusetts zips that scored lowest have historically been more (though none majority) Jewish, and wondered if that had bent the numbers any. I was a little surprised how few areas outside the five predictable cities made the cut. All the other cities had one or at most two bubble areas, even though those metro areas also have some wealthy suburbs. Pittsburgh, Tampa, Minneapolis, St. Louis and other big cities had zero. I speculate there is some anti-bubble effect in simply living closer to mainstream America. It's Lessons: 3 that I want to make a short observation about. The first graph is rather alarming, leaping up well above the 95th percentile, indicating that there is indeed a self-perpetuating 1%. Occupy Wall Street could only focus on the money per person because...well, there are a lot of becauses, and that's probably worth a post in itself. But the issue seems to be broader, and one that conservatives should be as concerned about as marxists. It's not just rich neighborhoods, but entire communities with self-reinforcing cultures. It's more than the 1% of people who had highest incomes in any given year, because those can be volatile. It's 2% of the communities, each of which has a range of incomes itself. Some of that is going to be old money that is no longer in the 1%, or families who have been in the 5% for a decade, whose children are growing up in a bubble. It is not only a 1% of wealth, but of authority and influence. Most liberals and all conspiracists would believe those are virtually identical and the latter follows from the former, but the overlap is not as great as imagined. There are plenty of people who have become wealthy who have little influence, except of course over their own business and perhaps over a corner of their industry. There is a great deal of difference between the power to do what you want and the power to make other people do what you want. So the OWS people weren't so much wrong as misdirected. It might help if you are talking to any of them to remember that. *It's a whole separate study, but I wonder if black and Hispanic elites are similarly isolated from mainstream blacks and Hispanics. I'm betting not. Good on them. Grim catches up with a statement of Hillary's about gangs. CS Lewis and JRR Tolkien agreed in 1938 to each write a work of speculative fiction, Lewis's to be about space travel, and Tolkien's about time travel. Lewis's became Out of the Silent Planet, and eventually the entire Perelandra series. Though he did work up a beginning for something called The Lost Road , Tolkien never completed his end of the bargain. Or did he? The food anachronisms in The Hobbit caused me to speculate recently about what supposed historical or prehistorical period LOTR actually represents in Tolkien's Time Periods. (I mean for you to glance at that again.) Reconsidering that essay these last two weeks, I am more convinced that the Hobbits are something of outsiders in Middle-Earth. They didn't time-travel to get to their spot in the Shire, of course - that would have entirely the wrong feeling in the mythos. But there they are, Leicestermen from the age of Victoria somehow voting, growing barley and tobacco, and erecting mills by the waters of a more ancient world. I very nearly said that clearly in the previous essay, but only got about 80% there. It may have been traveling through Bridgeport yesterday, which always reminds me of Twain's A Connecticut Yankee in King Arthur's Court, that nailed it down for me. * Subsequent fantasy authors seem to have adopted the same device because it works so well. Narnia is not a land of trains or boarding schools. Even without an exact correspondence between the worlds, it is clear that in spirit the Pevensie children are going back in time. Alan Garner, Susan Cooper, and Stephen Donaldson all use it. *"Bridgeport" is an early punchline in the book. I have decided I have been projecting in trying to understand the resistance many people have to the high-heritability, low environmental influence on adult abilities. I will set forth our story, but I want to read what others think. We were pretty much nuts, but mostly joyfully so and it mostly (not always) worked, for our family and those we were in contact with. We embraced and tried to put into play all the child-raising knowledge we could get our hands on: critical periods and the other Montessori tropes; learning styles; careful expositions of how one taught repentance and forgiveness; multisensory instruction; something pretty close to a homeschooling curriculum on top of sending them to private Christian schools; preserving independent learning and autodidacticism. Even as I began learning in the 1980's how much is hardwired, there was significant inertia for...well, we've still got Kyle, who is 20, and we still discuss exactly how we are going to present certain ideas, undermine others, and create an environment for him to learn his next life lessons. Twice over at Maggie's in the past day or so there has been discussion of women in math and science, and the usefulness of pre-K. Greg Cochran has just yesterday gone over some of the standard data about group differences, with specific references to famous academics who seem unable to absorb even the simplest parts of it. There is this persistence, a stubbornness, in clinging to the idea that so many pathologies are fixable if we just make the proper changes in the environment. I have mostly assumed that I understand this reluctance to accept genetic explanations, because I read my own feelings into it. Yet my feelings may not be at all representative. We accept that height is largely heritable, but weight...not so much. We see that a musical knack and sometimes genius seems to be "just there," and not teachable, yet we still focus on the 10,000 hours of hard work as the key. For schools especially, liberals and conservatives have visions of how things should be organised, and we get very upset about the cultural discussions. Yet, why? There is this idea that we just don't want to believe, no matter the evicence. Those who have some insight into how abilities and education are viewed in other countries, especially non-Anglospheric, non NW European countries are encouraged to weigh in on that as well. This came up in an email exchange. It is not well-edited on my part, yet I though it would have some interest. If you have been reading here long, not much will be new to you. The link to a previous post of mine includes a couple of you in the comments section, in fact. The occasion for my response was an essay by Patrick Dineen at Notre Dame, How A Generation Lost Its Common Culture. I remember it when it came out this winter. It is a good example of a standard theme in discussing modern students. But ask them some basic questions about the civilization they will be inheriting, and be prepared for averted eyes and somewhat panicked looks. Who fought in the Peloponnesian War? Who taught Plato, and whom did Plato teach? How did Socrates die? Raise your hand if you have read both the Iliad and the Odyssey. The Canterbury Tales? Paradise Lost? The Inferno? Who was Saul of Tarsus? What were the 95 theses, who wrote them, and what was their effect? Why does the Magna Carta matter? How and where did Thomas Becket die? Who was Guy Fawkes, and why is there a day named after him? What did Lincoln say in his Second Inaugural? His first Inaugural? How about his third Inaugural? What are the Federalist Papers? First, most people have never known these things, even in our previous ages of supposed great educational system and common culture. ED Hirsch and Allan Bloom were moaning about this 30 years ago as if the collapse had already occurred and we could just now be brought back from the brink. CS Lewis says something like it in his 1954 Inaugural lecture De Descriptione Temporum at Cambridge where he was appointed to a chair in Medieval and Renaissance Literature near the end of his career. Think of that: At one of the two elite universities in England in 1954, in a much more hierarchical culture where the middle and lower classes seldom qualify, speaking to students who are actually studying many of the great works of common heritage, Lewis is conscious of a divide between his culture and theirs - a loss of common ground that is new in the world with their generation. And Lewis pushes it very far back indeed. "As for the area and the tempo of the two deaths, if one were looking for a man who could not read Virgil though his father could, he might be found more easily in the twentieth century than in the fifth." I don't think, as is blithely claimed, that every age thinks that the previous eras were smarter and the rising generation poorly educated, but there's no difference every century really. I believe something of both claims. We are much smarter now, and since nutrition started improving for the general population in the past few centuries, we are smarter every decade. I think that accelerated about a hundred years ago and topped out in the late 20th C. If you traveled in time to 1880, nothing would impress you so much as what dolts people were, and how hard it was to find an intelligent conversation. On the other hand, the amount of common culture among the educated and even partly educated was much greater than now. Everyone, absolutely everyone in America read the King James Bible and Shakespeare. Even when they misunderstood what was in front of them, because they extracted what meanings the could from single texts - "Your body is the temple of the Holy Spirit" - it was at least a single stewpot that everyone was eating from. Did you ever wonder why memorising single verses and relying on proof texts is so common in the Church, and most of what we know of Shakespeare is individual phrases that have embedded into the language, even though we forget where they come from? That's why. There were two things people read, plus maybe Pilgrims' Progress or something about agriculture or etiquette or a copy of the Constitution, and if you were lucky a book of ancient history might show up. And newspapers once/week. Only if you had a tutor or later schooling did you hear about Plato or Marcus Aurelius. Though if you did have a tutor or later school, that's who you got. There weren't many choices on the menu, as there are now. So everyone had that as shared culture. We have a much more fragmented culture now, so that only popular culture is held in common. I think that will increase. I hate it, but I think that is what is. This is also the response when activists against the Eurocentric, Dead White Males version of civilisation complain that there are no women, no blacks, no gays, non Eastern philosophies, no Latinas, no indigenous peoples represented in our culture. They don't know the half of it. Tolkien fought to have English Literature added to the syllabus at Oxford in the 20th C! Beowulf, Chaucer, Milton, Spenser, were optional add-ons. American authors were not even mentioned, and that was largely true even in America until after WWII. You read those things on your own, or got together with like-minded others to discuss them. Those were not considered required material to be held in common. The Bible and/or the Book of Common Prayer were read by everyone who could read - on their own. That was largely true for Shakespeare as well, though he had made inroads. At school for the educated it was Latin and Greek. Ancient History. Trigonometry. The fragmentation of our shared literary and historical culture, then is simply a place farther down the road we started traveling decades ago. I met an interesting young woman when I got my tires changed today. She explained to me that the rubber in my sneakers prevented me from completing the energy cycle with the earth, and thus I lose energy while walking, unlike herself, who gains energy while walking because of her leather soles. She traveled 80 miles round-trip for a good deal on two tires. She also revealed to me things I didn't know about gypsies and Scandinavians. She speaks eight languages and can detect when Italian food has been made with metal cookware instead of glass bowls and wooden spoons. She didn't get around to explaining to me what Jesus really meant, though I feared at every turn that was coming next. I gave no word of contradiction to any of it. I will add that she talked about other subjects that she got moderately right. The Finns in New Ipswich. Orthodox Jews. It was just weird that she went so quickly to gypsies, Scandinavians, and languages where I actually have a little knowledge that could so easily contradict her. I liked her, though more in retrospect than at the time. She seemed a bright, untrained mind. Well-meaning, kindly. Just kind of ding-y. I don’t play computer games anymore, but I still remember the feeling of joy I would get discovering a hidden section in Commander Keen. I got that feeling on a brief excursion into the woods Sunday. I was going to bushwhack my own short cut-through over Bog Brook back to Bog Rd and pushed past some brush. A new path. New in this context actually means an old path, no longer used, but new to me. Such trails are usually leftovers from a single season when an area was logged. Pickup trucks or other equipment would have to get through on makeshift roads over broken terrain, with small logs packed parallel in wetter patches. It is not always obvious what town road or farm road these temporary tracks are going to lead back to, but the choices are few, so one gets pretty strong clues where it’s headed within a hundred yards or so. The other clues are the fun ones to read. How long ago was this road in use? How much moss has grown up on the wet logs, how much growth has come up in the tracks? If the trail in question continued in use for snowmobiles or four-wheelers for a few seasons, those clues might suggest different answers. How old are the younger trees in the area? No one clear cuts in this area anymore, so there are some older trees even in woodlots that were heavily cleared, and very old trees in the corners where stone walls meet. The whole place went to white pine over a hundred years ago as the farms were abandoned, so you can see at a glance the places that haven’t been logged in the last century. But new growth forest springs up where there was harvesting, and the age of the first-growth trees is a clue. Witch hazel, pin cherry, and alder come up first. I think I know those. Aspen, and paper birch are theoretically next and those I’m solid on identifying, but they aren’t as common in my particular patch. Don’t know why. Red maple and hemlock I have seen in the forest, but not in any of the patches I’m estimating the age of. Beeches are more common than the birches somehow. Sawed-off logs are another clue, where a width had to be cut when a tree fell across the trail. It can be hard to tell whether that cut was made for the pickups in the original year or was cut later to let snowmobiles pass. I have decided there are no clear signs where any such road was after 20 years of inactivity. I am sure that roads that were used over decades remain visible longer, but those single-season routes disappear. Even fifteen years seems to be a lot unless you get extra clues from running along a wall or happening upon the makeshift log bridges through swampy spots. I got an extra set of clues where the path divided further on. One branch was still being used by the occasional four-wheeler until 2-3 years ago, the other branch doesn’t seem to have been touched in ten years. There were possible other paths off both branches, though I didn’t follow them. I can sense where they would cross paths still in use and will learn someday whether they are actually ex-paths or random brief clearings leading nowhere. For now, not much interest. I’d like to talk with the people nearby sometime and see if my guesses are accurate reflections of when the place was logged, or if I am just making up numbers. It's not very clever of me to think I know better than executives at a company that basically just prints money for itself. Somebody knows something there. OTOH, they kept kicking the concussion thing farther down the road, when anyone who had their data and looked around at American society could guess that they weren't going to easily fix this, easily outrun this, or easily keep it secret. Perhaps it's something like the housing and mortgage bubbles - the big fish all think they are going to cash out in time. Plus, come to think of it, they still haven't figured out how they are going to navigate suspensions for on-field versus off-field behavior. And don't get me started on the Ideal Gas Law. Still, they are making all that money. So when they say they want to put a team in London to break into the international market, maybe they are onto something despite it being a logistical mess. I can see why they don't like the impression, the "optics" as we say now, that a team in Las Vegas would present, but really, most fans won't care in the least. Los Angeles now has a team again, but it could probably carry two. Texas is crazy and could support at least one more team. My thought is...Mexico City is better than all those choices. Time zone travel is a lot better, it has 20 million people, with way more Americans than any other foreign city, plus an upper class of its own that will sign on. In fact, you put in two teams, one marketed to the working stiff and one to social climbers, which I believe is standard practice throughout Latin America and pays off handsomely. Actually, that works many places in the world, including New York and San Fran/Oakland. As for London, don't you pair that with another European city to bring it on line - someplace in Germany where there are lots of American servicemen and businessmen? Less jet lag, natural rivalry. Just adding a team in London seems a bit nuts. Is it sometimes rational to refuse psychiatric treatment? If yes, how do we justify mandating it for some people? Well, see above conflict between different parts of the system regarding what you should and should not be allowed to do. Dangerousness is the usual dividing line in statute. If you are dangerous to self or others, or have an inability to care for yourself – leaving food out for days, not paying the heating bill, not attending to a wound – we can put you in a hospital. In NH, we still can’t make you accept treatment except under very specific circumstances, usually involving additional hearings. Merely being inconvenient or annoying to society isn’t enough. Having recently been dangerous is not enough. Our wanting to treat you and send you on your way so we can use the bed for someone else isn’t enough. Preventing you from losing your job, your family, your housing, and all your money isn’t enough. From a hospital perspective, you can refuse a lot of treatment for very bad reasons. So I bristle a bit at the very question of the rationality of refusing treatment. Then I remember the added requirements that some people in my field would like to require you to do, and I realise my view comes from one place in the system. I also remember individual cases where we shrugged and said “Fine then, that’s your choice” even when we disagreed. In fact, we do it a lot. Those don’t stick in the mind because we have had those philosophical discussions years ago and we don’t revisit them. It is in our bones to know what we are going to insist on and what we won’t. We also know we are far more permissive than families, neighbors, landlords, and local police would have us be, so we tend to disregard accusations from the opposite flank. What does stick in the mind are the daily discussions with psychotic people who have very bad reasons for refusing medications that they very much need, so I tend to think of that as the primary issue. I blind myself. I actually know dozens of cases, maybe hundreds, that lie on the borders of the rules and rights, cases where it is not clear what should be done. I tend to see each of those as an exception, so I have never thought of categories of them, or what lessons might be learned. I’m not sure how I would go about recalling them all, or even some significant percentage of them at this point. But those are likely to be the more interesting questions for the general reader. I'll try. Outpatient commitments to treatment do indeed imply that law enforcement might have to become involved if there is noncompliance (the PC term is nonadherence now for reasons which were never clear to me). That is how it plays out in NH. It is a sheriff’s dept which transports you to the state hospital from an emergency room or a courthouse. There has been an exception over the years. There are a few hospitals which are designated receiving facilities and have some involuntary psychiatric beds, so it is possible to go directly to a psych unit from their ER. As this involves armed hospital security officers, however, it’s not much different. Being brought to the ER may have also involved law enforcement, though of course one might walk in, be brought by family, or come by ambulance. Yet this is not specific to outpatient commitments, but to all secure transport, including those with mental illness. Sheriff’s departments often have required procedures which include handcuffing, even of small children or frail grannies. Neither of those are typically under conditional discharge. I have never seen it used with children, and chronically mentally ill elders have usually long since been assigned guardians who can consent to transport on their behalf. Update on "My Brother Ron." Christopher B’s comments under My Brother Ron are quite good. The original essay from Slate Star Codex was long, you may recall, and covered a fair bit of territory. I had been thinking along different lines, so it was good to get reminded of a few important pieces I had let drop away. I am going to break this into two or even three posts simply for length. More to follow. NH has both a Conditional Discharge Law and an Outpatient Commitment Law. We rarely used the latter until a bizarre Medicaid billing regulation backed us into that corner. Now we use either. Other states are starting to develop outpatient commitment laws, but these are more limited: they can only be granted if the person has been convicted of a crime, for example – which gets odd when a person is incompetent to stand trial, NGRI, or the prosecutor believes treatment would be a better option and would prefer to drop charges. Also, sometimes medication is the only treatment that can be required, which represents a failure to think things through. Some medications require lab work for safe administration, or to measure whether the meds are being taken (cheeking meds is an art form); sometimes a simple weekly appointment for fifteen minutes conversation and observation can be enough to reveal mood or cognitive changes; lastly, the comorbidity with substance abuse is very high, so forbidding or limiting their use can be important. There is a natural split between hospitals and community mental health centers in designing outpatient treatment. The hospitals are full, and overfull. We have a 50-person queue in emergency rooms across the state awaiting a bed here. We are absolutely not holding people here because we don’t like the cut of their jib. The criticism directed toward hospitals is not that we are holding people too long but that we are releasing dangerous people far too soon. When we release them on conditions, we are not at all minded to include conditions which will bring them back to the hospital when they don’t need to be here. The Conditional Discharge Statute is actually quite clear that we are not allowed to mandate what treatment might be good for them or maximize their chances of having a good life. We are only allowed to require they comply with treatment that prevents rehospitalisation. Insurers are even more radical than we are in this. If a person has not been actively suicidal the last 24 hours they will refuse to certify further hospitalization, regardless of the severity of the attempt or whether the person’s symptoms have improved. Community Mental Health Centers, on the other hand, see the lives in community that people are actually living and advocate for us to increase the requirements of what treatment a patient should comply with. I get it. They see bad lives, they see that with just a tweak and a heavy hand they could use the full weight of the state and rescue someone. Tony does better when he has some sort of daily activity to get up for, so we want to mandate a day program, volunteer work, or meeting with voc rehab. Debra’s sobriety is key so we want her to attend AA 3x/week. Or better (worse) yet, We want to mandate her to a 28-day rehab before she comes back to the community (which involves staying in an acute psychiatric facility until we can get her into one of those, of course). If Jon had to go over to the MHC every morning to get his meds it would get him up and moving. Amber really needs DBT, we want that to be one of the conditions. Whenever Lucas goes up to visit his mother in Laconia it’s a sign that he’s not doing well; we want to be able to revoke him for that. When Daniel starts talking about the Holy Spirit it means he’s decompensating. Natasha would feel better about herself if she lost weight – can we require some sort of exercise plan and only going grocery shopping with her functional support staff? These interventions start out based in kindness but get out of control fast. Reading Christopher B’s comment reminded me of that fascist streak which was such an important part of pushing me out of liberalism in the 1980’s. The psychiatrists, psychologists, and social workers at the CMHC’s want to make you do what’s good for you – and very often, you are dangerous without it and you should be made to do it. The attorneys and social workers at Disability Rights and the ACLU want to make the institutions do what is good for them* - and very often the institutions are dangerous without that and they should be made to do otherwise. Both do much good in the world – but it goes bad so, so fast. That’s pretty much my view of all mandated regulation. You scoop up the low-hanging fruit and most egregious injustices at the first pass, and it is almost always a good thing. Which encourages people to think that the next batch of regulations is going to create a similar improvement. *Wait, aren’t they advocating on behalf of patients so they have their rights? No, they are advocating against institutions. They are not without warmth, concern, and compassion, certainly. But it’s not their big ticket item.You have to sit across a table - or a courtroom - from them a dozen times before you get how pleasurable it is to them to make big institutions do what they tell them. Sniffing that, sensing that, absorbing that in the 1980's was very powerful for me.